Despite denials, Rwanda has now closed the border with Uganda and restricted the movement of Rwandans, signalling an escalation that could easily be sparked into a full border conflict. For those who pay only superficial attention to Rwanda-Uganda relations, it may come as a surprise little inconvenience. For General Yoweri Museveni and General Paul Kagame, and the African nations they rule with iron fists, the stakes are much higher and grievances much deeper. In thinking aloud, I have pondered on three anecdotes that cast some light on the clash of outlooks, personalities and interests between the two generals. In 2000, General Kagame sought to remove then President of Rwanda, Pasteur Bizimungu, and formally occupy the Presidency that he had hitherto controlled from behind. He sent me as an envoy to explain the impending action to General Museveni. When I conveyed the message to General Museveni in the presence of the late James Wapakabulo and Kale Kayihura, he was opposed to the idea. He asked me, “if not Pasteur Bizimungu which other Hutu do you have to replace him, for you still need them?”. Being the loyal cadre of RPF I was at the time, I argued that General Kagame had enough credentials to become the President of Rwanda. When I reported back, General Kagame and the exclusively Tutsi military officers and RPF angrily charged that President Museveni wanted to control Rwanda. During the Kisangani clashes (1999-2000) in the Democratic Republic of Congo between Rwanda Defence Forces (RDF) and Uganda Peoples Defence Forces (UPDF), President Mkapa of Tanzania tried to mediate between the two generals to find an amicable solution to the conflict. In one encounter, General Museveni explained to President Mkapa that enzigo lies at the heart of the conflict. President Mkapa lightly commented in Kiswahili that whatever it is, “iyi mambo ya enzigo” is serious. I have no space to explain to non-Runyakole, non-Kinyarwanda speakers the deep meaning of enzigo or inzigo. Paraphrased, the term simply means that if you kill one of my own, there will be pay-back time. In a few encounters I had as General Kagame’s envoy to General Museveni during and after the Kisangani crisis, I soon realized that neither had the patience to listen to each other points of view, and both reacted angrily when I (the messenger) delivered the message from the other side. The three anecdotes by themselves may not mean much. In the context of convoluted life histories of both generals, a patient and engaged observer will note some striking differences and similarities. Both generals are descended from humble beginnings among minority ethnic groups; came to power by force of arms; have overstayed in power by coercive means and manipulating constitutions and electoral processes; court Western allies (notably United States and United Kingdom) by offering the services of their militaries in the regional war on terror and peacekeeping; have overextended their reach beyond their national boundaries; and above all, they both possess big egos, and predominantly rely on military means to solve political problems. General Kagame is very different from General Museveni in fundamental ways. There was a time in his early years before, during, and after the capture of state power when General Museveni was the intellectual who inspired his followers. Rwandans like the late General Fred Rwigyema, General Paul Kagame, and many others who now dominate state structures in Uganda and Rwanda then found in him the revolutionary and visionary. General Kagame despises ideology. Once in a while, he may make Pan Africanist and nationalist pronouncements, but at every opportunity, he has betrayed Rwanda’s and African interests. His maxim is “the end justifies the means, and I define the ends”. He is the efficient operational man who hardly inspires and executes his ambitions through fear and naked brutality. General Kagame has deep insecurity that he compensates through aggressive behaviour and taking big and highly risky bets. General Kagame has fought armies of former Zaire and toppled dictator Mobutu; he installed President Laurent Kabila in DRC; he has fought armies of Angola, Zimbabwe, and Namibia; he has fought Uganda’s UPDF in DRC; he has quarrelled with Tanzania, Burundi, and South Africa; he has thrown temper tantrums at France, and even to his benefactors USA and United Kingdom when they shyly question the assassination of opponents and absolute closure of political space. General Kagame and the all-Tutsi cast of military officers are proud of this record and have cultivated an aura of invincibility, extreme arrogance, and a propensity to take ever-increasing and bigger risks. General Kagame rules through the notorious Directorate of Military Intelligence (DMI) that he personally supervises and which sits at the apex of the entire security establishment and Rwandan society. It is an enterprise that has grown regional, continental and global through a seamless web of businesses, media outlets, financial networks, webs, Diaspora citizen groups, prominent personalities like former President Bill Clinton, former UK Prime Minister Tony Blair, evangelicals like Pastor Rick Warren, shadowy consultants from an array of retired military and intelligence officers from across the world. DMI is constantly in a state of flux, deploying formally and informally, absorbing and rejecting operatives and co-opting many in its ranks. The whole of Rwandan society stands in awe and fear of DMI because DMI is General Kagame who has been its only constant since 1990. Uganda is yet to fully grasp the full extent of DMI’s infiltration of Ugandan society. Until and unless it does, its interests will always be in harm’s way. This is the machinery that General Kagame has deployed in Uganda for a long time, leading to the Kale Kayihura-MTN-border closure saga. From the much, I know about General Kagame and Rwanda’s secrets, the closure of the Rwanda-Uganda border is a deliberate escalation to find pretext to execute a plan that exists in Kigali. The plan includes a surprise quick pre-emptive strike, capture of territory deep in Uganda to avoid fighting in Rwanda which lacks depth, creating and linking up with anti-Museveni forces, creating chaos in Uganda, and familiar extreme measures like assassinating prominent political leaders, including General Museveni himself. The border-closure is also vintage General Kagame, trying to attract attention from his benefactors, to extract some concessions from regional and international stakeholders, and masking internal contradictions within Rwanda. General Kagame’s allegation that he is fighting General Nyamwasa’s Rwanda National Congress (RNC) and its so-called P5 supported by Uganda, and FDLR (both allegedly supported by Burundi) is an absurdity, like flogging dead horses. I co-created and led RNC from 2010, and later the P5 until I abandoned them in 2016 due to irreconcilable ideological differences. General Kagame knows that RNC, P5, and FDLR do not pose any serious threat to his rule; they all are a lose amalgam of extremist individuals or groups full of militaristic wishful thinking, lacking ideological depth and coherence, with no operational capability even to remove him from power and replace him with another brutal dictatorship like his. General Kagame needs FDLR, RNC, and P5 as scapegoats to justify his aggression as he continues to keep Rwandan citizens as hostages under fear. 1. Everything must be done to de-escalate the build-up of tension between the two countries. A war between the two countries, even one of limited objectives, will have unintended consequences of far-reaching social, political, economic and military implications. The first victims of such a war may be the generals themselves. 2. Uganda should prepare but ignore General Kagame’s provocations, and deny him any pretext of starting a conflict that neither country will be able to stop. 3. 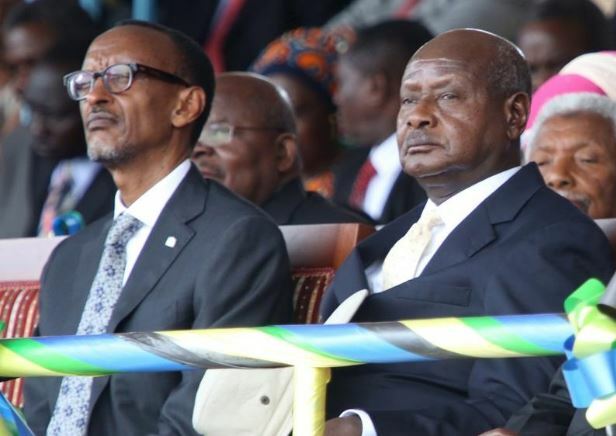 Uganda and Rwanda should stop relying on the relationship between General Museveni and General Kagame as the defining element of the relationship between the Ugandan and Rwandan peoples. These nations and their peoples have always been there long before the generals were born, and will be there long after they are gone. 4. The East African Community is sailing in perilous waters, doomed to failure or useless existence when it is led by people like General Kagame, who serves neither interests of Rwandan citizens nor those of East Africans. The free movement of peoples, goods, and capital must be allowed without hindrance. Perhaps President Magufuli of Tanzania and President Kenyatta of Kenya should take initiative to bring to the attention of the East African Community the matter of closing the Rwanda-Uganda border. The East African Community may seek the wisdom of elder statesmen like former Presidents Moi, Kibaki, Mwinyi, Mkapa, and Kikwete in de-escalating the Rwanda-Burundi, and Rwanda-Uganda tensions. 5. General Kagame’s aggressive external behaviour is conditioned by his domestic dictatorial policies that deny basic freedoms to the Rwandan people, Ultimately, East Africa should only hope to have sustained peace and prosperity if it supports peaceful and democratic change in Rwanda. That will entail confronting General Kagame’s regional belligerence head-on as an indispensable component. General Kagame, presiding over landlocked Rwanda, is endangering the lives of Rwandans and East Africans by projecting hostility towards all his East African neighbours of Burundi, Uganda, DRC, and Tanzania. It is suicidal, foolishness, despair, and dangerous adventurism to cultivate your own encirclement. It is time for Rwandans, Ugandans, and East Africans to unite to prevent another catastrophic war in the Great Lakes region. It is time to resist General’s Kagame’s aggression, violent schemes, and war-mongering in the interest of peace, security and prosperity for all East Africans.